LONDON — Britain’s most prominent heads of religion have called for the release of the seven Baha’i leaders serving prison sentences in Iran. A statement by the United Kingdom’s religious leaders – describing the sentencing of the seven as a “gross violation of the fundamental human right to freedom of religion” – was signed by, among others, the Archbishop of Canterbury – who is the head of the worldwide Anglican communion; the Roman Catholic Archbishop of Westminster; the Chief Rabbi of the United Hebrew Congregations of the Commonwealth; and the Assistant Secretary General of the Muslim Council of Great Britain. “These sentences form part of a wider picture over many years of severe harassment of the Baha’i community,” says the statement. The seven Baha’i leaders – Fariba Kamalabadi, Jamaloddin Khanjani, Afif Naeimi, Saeid Rezaie, Mahvash Sabet, Behrouz Tavakkoli, and Vahid Tizfahm – were all members of a national-level group that, with the Iranian government’s knowledge, helped see to the minimum spiritual needs of Iran’s 300,000-strong Baha’i community. After being incarcerated without charge for 20 months, and six brief court appearances, the seven were each reportedly sentenced to 20 years imprisonment for propaganda activities against the Islamic order and the establishment of an illegal administration, among other allegations. All the charges were completely and categorically denied. It was reported last month that the sentences have been reduced to 10-year jail terms. “We view this act as a gross violation of the fundamental human right to freedom of religion and call on the Iranian government to fulfill their obligations under article 18 of the United Nations Declaration of Human Rights to review the case and to ensure that the treatment of these ‘prisoners’ accords with justice and due process as defined in the Iranian constitution and law,” wrote the United Kingdom’s religious leaders. “We extend our sympathies to the Baha’i community at this difficult time and hope that the widespread and growing international concern over this matter will cause the Iranian authorities to correct this flagrant injustice,” the statement said. The statement is signed by The Most Reverend Rowan Williams, Archbishop of Canterbury; The Most Reverend Vincent Nichols, Archbishop of Westminster; Chief Rabbi Lord Sacks; Shaykh Ibrahim Mogra, Assistant Secretary General of the Muslim Council of Britain and chair of Religions for Peace UK; Mr. Jay Lakhani, Hindu Academy; Mr. Arjan Vekaria JP, President, Hindu Forum of Britain; Dr Indarjit Singh CBE, Network of Sikh Organisations; and Dr Natubhai Shah MBBS PhD, Network of Jain Organisations, Council of Dharmic Faiths. Reports of the sentencing of the seven Baha’i leaders has provoked a global chorus of condemnation from governments, human rights organizations, other groups and countless individuals. 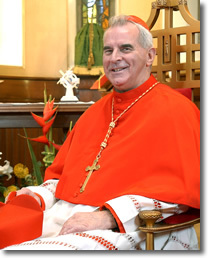 Archbishop and Metropolitan of the Archdiocese of St Andrews and Edinburgh is Cardinal Keith Patrick O’Brien. “We are deeply moved by the sympathy and solidarity expressed by the UK’s significant religious leaders for our beleaguered brethren in Iran,” said Dr Kishan Manocha, the United Kingdom Baha’i community’s director of external affairs. EKKLESIA; A new way of thinking is another site covering this important news. الكومنولث ، والأمين العام المساعد للمجلس الاسلامي في بريطانيا العظمى. والحقوقيون المستقلين تستند فقط على ايمانهم”. إنتهاكات خطيرة ضد الطائفة البهائية” . الواجبة على النحو المحدد في الدستور الإيراني والقانون” . الإيرانية لتصحيح هذا الظلم الصارخ” ، حسبما ذكر البيان. الدكتور سينغ إندارجيت ، وشبكة من منظمات السيخ. القيادات الدينية في المملكة المتحدة كبيرة لاخواننا في ايران” . This entry was posted in Questions and tagged Afif Naeimi, and Vahid Tizfahm, Archbishop of Canterbury, article 18 of the United Nations Declaration of Human Rights, Assistant Secretary General of the Muslim Council of Britain and chair of Religions for Peace UK, Assistant Secretary General of the Muslim Council of Great Britain, Bahaís of Iran, behrouz tavakkoli, Chief Rabbi of the United Hebrew Congregations of the coomonwealth, Council of Dharmic Faiths, Dr Indarjit Singh CBE, Dr Natubhai Shah MBBS PhD, fariba kamalabadi, flagrant injustice, freedom of religion, harassment of the Baha'i Community, Hindu Academy, Hindu Forum of Britain, human rights, humanitarian and legal norms, International Community, Iranian government, jamaloddin Khanjani, Jay Lakhani, Mahvash Sabet, Mr. Arjan Vekaria JP, Network of Jain Organisations, Network of Sikh Organisations, President, Roman Catholic Archbishop of Westminster, Saeid rezaie, Shaykh Ibrahim Mogra, wrote the United Kingdom's religious leaders, Yaran. Bookmark the permalink. Whoa, whoa, get out the way with that good innrmoatiof.